Shown above are four unique uniforms attributed to General Lee. They are arranged left to right in the chronological order he probably acquired them. By clicking on the individual coats above you will be taken to the detailed information for that particular uniform. Two of these uniform coats are still in existence today. The Surrender uniform is on display at the Museum of the Confederacy. Lee's "Maryland Uniform" is at The Maryland Historical Museum. The blue grey color (called Cadet Grey) can appear different shades depending upon the light conditions available at the time the photograph was taken. Plus different dye lots can vary slightly. All but Lee's Maryland uniform are Cadet Grey Wool. The Maryland Uniform is Medium Grey wool and is technically a Colonel's coat with 3 six pointed stars on each side of the collar without the wreath. The button pattern used is seven buttons spaced evenly typically seen on Officer's uniforms below the rank of General. Lee 1862 Frockcoat: This uniform is copied from the famous Minnis and Cowell photo of General Lee taken in 1863 in their Richmond studio. This portrait is often referred to as the "Booted and Spurred Lee" since Lee is posed in a very "soldierly" manner. The coat is not known to be in existence today, but was most likely Cadet Grey in color- Lee's preferred color choice. In the original photo, no collar or cuff trim is evident, however various rows of sleeve braid are detected under a magnifying glass. The collar carries three five pointed stars without the typical general's wreath surrounding the stars- usually indicative of a full Colonel. Virginia State seal Staff buttons are supplied for the front in the General's button pattern- four sets of 2. We have installed four rows of the gold sleeve braid to indicate general rank. Our reproduction is made in Cadet Grey wool and has a Black Polished Cotton lining with natural cotton sleeve lining. Back Pockets with flaps in the folds of the skirt. Skirt is left raw- typical in those days. Because this is an exact reproduction of one specific uniform, we can't offer any changes from the original. Matching Vest and Trousers are available in the additional order boxes below the coat order box. Vest is cadet grey wool with black polished back. Notched collar style with two front pockets and 8 small Virginia State seal staff buttons are supplied. Trousers are cadet grey wool with side seam pockets and a waistline watch pocket. Real bone buttons are supplied for the double button front pattern- suitable for our #1907 suspenders. Trousers are supplied unhemmed at 34.5" inseam for you to hem them the length you want. Or, we can hem them at your desired inseam for additional charge. Please double check your inseam. Trousers hemmed too short cannot be made longer! 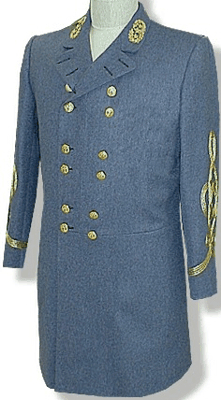 Lee Maryland Frockcoat: This uniform is copied from Lee's original coat now located at the Maryland Historical Museum. It was presented to General Lee by Southern sympathizers from Baltimore, Maryland in 1863. The coat is a medium shade of true grey. Collar and cuffs were plain without trim color. Sleeves have a split cuff but are tube style (non-functional). Sleeve Braid was not used. The collar has three SIX pointed stars without the wreath surrounding the stars. This would typically be considered the frockcoat of a full Colonel. Maryland State seal buttons are supplied for the front in the standard Colonel's arrangement of 7 individual buttons on each side. Our reproduction is made in the Medium Grey wool and has a Brown Polished Cotton lining with natural cotton sleeve lining. Back Pockets with flaps in the folds of the skirt. Skirt is left raw- typical in those days. Because this is an exact reproduction of one specific uniform, we can't offer any changes from the original. Matching Vest and Trousers can be ordered- Please Scroll down this page. Vest is Medium grey wool with brown polished back. Notched collar style with two front pockets and 8 small Maryland State seal buttons supplied. 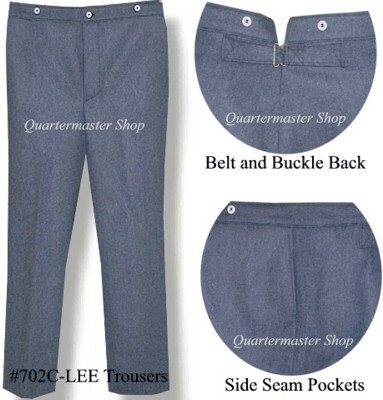 Trousers are Medium Grey wool with side seam pockets and a waistline watch pocket. Real bone buttons are supplied for the double button front pattern- suitable for our #1907 suspenders. Trousers are supplied unhemmed at 35" inseam for you to hem them the length you want. Or, we can hem them at your desired inseam for additional charge. Please double check your inseam. Trousers hemmed too short cannot be made longer! Lee 1864 Frockcoat: This uniform is copied from the famous Matthew Brady photo of General Lee taken late April 1865 on the back porch of Lee's home in Richmond. This portrait is often referred to as the "Back Porch Uniform". It is not known if this coat is in existence today, however, it was most likely Cadet Grey- Lee's preferred color choice. The collar and cuffs are plain without trim color. Sleeve Braid was not used- making this a type of field uniform. The collar is a laydown civilian style and has three five pointed stars without the typical general's wreath surrounding the stars- usually indicative of a full Colonel. Virginia State seal Staff buttons are supplied for the front in the General's button pattern- four sets of 2. Our reproduction is made in Cadet Grey wool and has a Black Polished Cotton lining with natural cotton sleeve lining. Back Pockets with flaps in the folds of the skirt. Skirt is left raw- typical in those days. Because this is an exact reproduction of one specific uniform, we can't offer any changes from the original. Matching Vest and Trousers are available in the additional order boxes below the coat order box. Vest is cadet grey wool with black polished back. Notched collar style with two front pockets and 8 small Virginia State seal staff buttons supplied. Trousers are cadet grey wool with side seam pockets and a waistline watch pocket. Real bone buttons are supplied for the double button front pattern- suitable for our #1907 suspenders. Trousers are supplied unhemmed at 34.5" inseam for you to hem them the length you want. Or, we can hem them at your desired inseam for additional charge. Please double check your inseam. Trousers hemmed too short cannot be made longer. 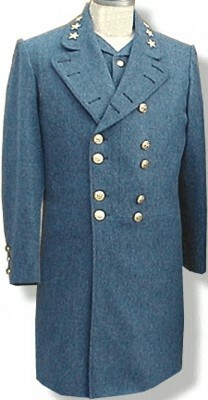 Lee 1865 Frockcoat: This uniform is copied from the original Lee uniform located at the Museum of the Confederacy in Richmond Virginia. It is called "The Surrender Uniform". The coat was made from imported English cloth at the direction of Maj. J. B. Ferguson. The color is Cadet Grey. Eye witness accounts of the Surrender mention that Lee was resplendent in a NEW full dress uniform. Three small buttons and four rows of intricately woven gold Flat braid adorn the sleeves. No trim colors are used on the uniform. The collar is a civilian laydown style and has the regulation Wreath and Stars embroidered directly on the collar- not a separate badge. Confederate Officer Eagle buttons are supplied for the front in the General's button pattern- four sets of 2. Our reproduction is made in Cadet Grey wool and has a Black Polished Cotton lining with natural cotton sleeve lining. Back Pockets with flaps in the folds of the skirt. Skirt is left raw- typical in those days. Because this is an exact reproduction of one specific uniform, we can't offer any changes from the original. Because the embroidered collar must be custom ordered from overseas, please allow 12 weeks for delivery. Matching Vest and Trousers are available in the additional order boxes below the coat order box. Vest is cadet grey wool with black polished back. Notched collar style with two front pockets and 8 small Conf Officer Eagle buttons supplied. Trousers are cadet grey wool with side seam pockets and a waistline watch pocket. Real bone buttons are supplied for the double button front pattern- suitable for our #1907 suspenders. Trousers are supplied unhemmed at 34.5" inseam for you to hem them the length you want. Or, we can hem them at your desired inseam for additional charge. Please double check your inseam. Trousers hemmed too short cannot be made longer!